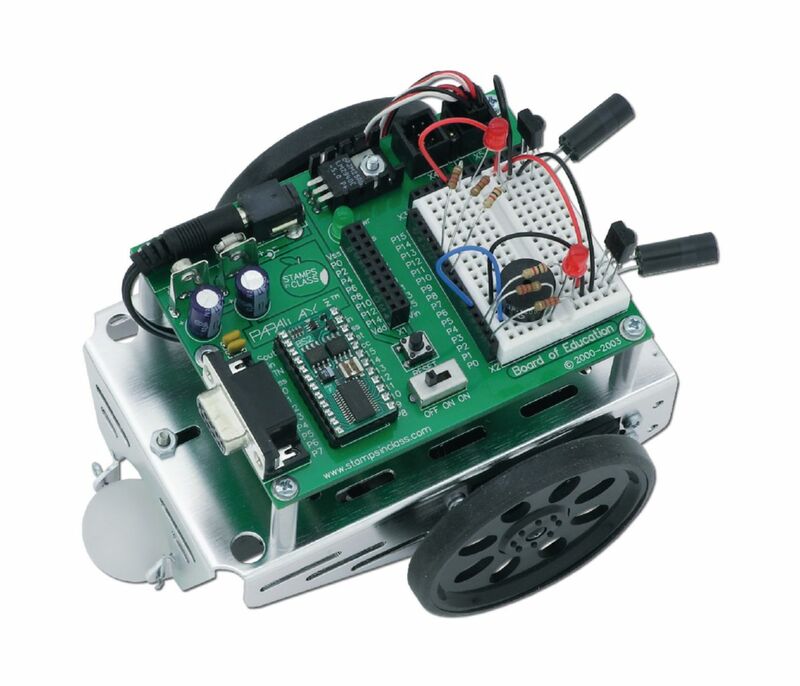 The Boe-Bot Full Kit is a complete, reprogrammable robot kit. The robotics instruction manual includes 41 new activities for the Boe-Bot robot with structured PBASIC 2.5 source code support and bonus challenges with solutions in each chapter. Starting with basic movement and proceeding to sensor-based projects, users learn how the Boe-Bot is expandable for many different robotic projects. No previous robotics, electronics, or programming experience is necessary. Users learn about embedded projects from wiring and components to programming and mechanical dependencies. The Boe-Bot robot takes about one to two hours to put together, but each project provides a unique new experience of wiring and source code tuning. Over 90,000 Boe-Bot robots are in use by hobbyists, educators, and students around the world. It’s built on a high-quality brushed aluminum chassis that provides a sturdy platform for the continuous rotation servo motors and BASIC stamp module's Board of Education carrier board. Many mounting holes and slots can be used to add custom robotic equipment. A cotter pin holds the rear wheel, a slider ball, in place. Drive wheels are molded to fit precisely on the servo spline and held in place with a small screw. Ordering information: This kit includes a 200-page robotics book, detailed pictorial and schematic formats, and complete assembly and programming instructions. The kit also includes a set of passive components (wires, resistors, capacitors), sensors (photo resistors, bumpers, infrared sensors), and hardware (whisker touch-sensor kit) to complete the different projects.